24,000 liters of water to produce 1 kilogram of chocolate? Most water uses in the world occur because every time you buy stuff you use water all around the planet. It’s called the virtual water trade. Water is used in the production process of many products. This is called "virtual water". When products are traded between countries, so is the water used in those products. This "virtual water" trade reaches about 1,300 square kilometers per year. On average, it takes 24,000 liters of water to produce 1 kilo of chocolate. 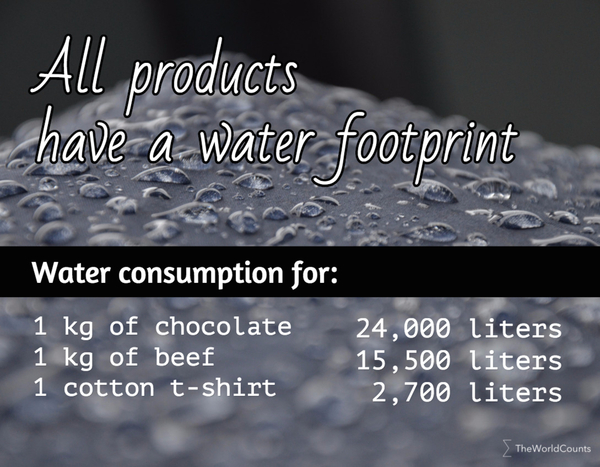 Similarly, 1 kilo of beef takes 15,500 liters of water, 1 cup of coffee takes 140 liters, 1 cotton shirt takes 2,700 liters, 1 sheet of paper takes 10 liters, and 1 glass of wine takes 120 liters. Some countries import more than 80 percent of their water through the products they consume. Changing what we eat to less water intensive products can have enormous impacts on water use. To illustrate: Replacing half the meat eaten in the USA with vegetables can lower the country's annual water use by 256 cubic kilometers - enough to fill the empire state building 28 times every hour. …this would free up enough water to provide healthy diets for almost 400 million people; nearly 25 percent of the expected population increase in the developing world by 2025. The World Water Council estimates global trade in virtual water at 1040-1340 billion tons a year. We use the upper estimate as this is close to the estimate given in “The living planet report 2008” (1,350 billion tons). There are a few important shortcomings to the notion of virtual water. You can read more about the key shortcomings on wikipedia. Interested in more facts like the trade in 'virtual water'? Then plug in and subscribe to our newsletter.